Aren't those mountains majestic? When I see mountains like this, to me, they just reflect God's glory, they reflect His creation and the mountains just praise Him. It's humbling. Labor Day weekend snuck up on us real quick! Last week Dave and I decided we should go some where so we started brainstorming, where? For some reason I've just had a craving to see some big Colorado mountains. There is something about them that draws you in. We had talked before about visiting the sand dunes and the drive is only 7 hours away so we picked there for one of our destinations. 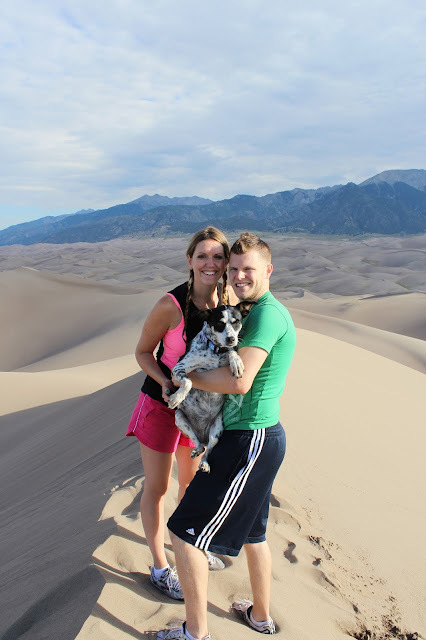 The sand dunes in Colorado are the tallest in North America. Next to the mountains they don't look that impressive but close up, they sure do. Here is the start to our early morning hike. Isn't the sunrise pretty? Dave enjoys running and speeding up those dunes. Me, not so much! Hiking in sand is tough stuff. See Static looking back? This is the classic 'where is Beka?' look. It happens all the time and is quiet entertaining. Here is Static near the top of the dune. Isn't she cute? If you want to know how to make your dog pose like this just say 'squirrel' real loud. We do this all the time to poor little Static but it works. Here we are at the second tallest dune. I liked the sun rays. Aren't they pretty? Dave didn't mind ... he took off running down that steep hill. Can you see Dave? He is the tiny little dot on that dune. Static saw Dave too but she was tired like me and didn't want to run and climb back up. She watched from a distance too. The golden valley, that's what I'm calling it. I don't know it's official name. There is part 1 to our Labor Day adventures. The dunes and mountain hiking were to pretty to put into one blog post so they are each getting there own. I hope you all had a great holiday weekend.